COMFORTABLE AND BODY FORMING: The ultimate wedge pillow comes endowed with a padded cover and is the ideal shape for a good night’s sleep...and, for that matter, an extended period of therapeutic bed rest. Unlike those pillows that slip, slide and flatten out underneath you, this bed wedge is the ideal position pillow...one that feels very much like a massage wedge. Aside from enhanced health, this pillow can help ensure a better night’s sleep and even improved reading and TV watching sessions. The pillow measures 30' x 26' x 4'. Acid reflux is a disease that afflicts more than 60 million Americans. Believe it or not, a strong and reliable acid reflux pillow actually can help relieve the effects of this painful and discomforting condition. Deluxe Comfort’s acid reflux wedge leg elevator may be the ideal pillow for helping manage acid reflux. The original bamboo pillow, this luxurious and exotic wedge pillow will help you sleep better...not to mention healthier. This angle pillow wedge sits at a decided incline beneath the head, supplying the upper body support needed to combat the occurrence of acid reflux in the body. This is the gerd wedge pillow or heartburn pillow that truly makes a difference...a superior incline pillow quite unlike the standard flat pillow that holds little therapeutic value. This just may be the perfect bed wedge for acid reflux, helping you to both alleviate and combat the recurrence of this all-too-common medical problem. Infinite comfort is yet another benefit of this luxuriating sleep wedge, which comes complete with a whisper-soft padded cover and a generous size that seems to facilitate a pampering and totally restful night’s sleep. 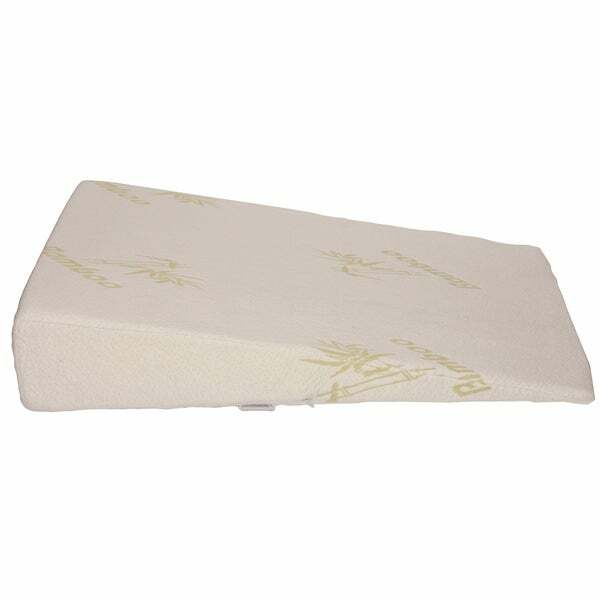 Lose yourself in the heavenly contours of this 30' x 26' x 4' sleep-improving pillow wedge, which is sure to comfort and support you throughout the night as you enjoy the ultimate respite. Of course, this divine incline sleep wedge is not only for sleeping. It also provides able support for numerous other needs, like a wedge book pillow or a reading bed pillow, a pregnancy wedge to facilitate that challenging time of life, a wedge travel pillow to take with you on long trips, and a nice napping pillow as well. Deluxe Comfort’s acid reflux wedge leg elevator will win your heart as it places you firm on the road to recovery; and, for that matter, to a better night’s sleep! Dimensions 30" x 26" x 4"
I have tried pillow wedges before but found I always slid down on them during the night which defeats the purpose. I place my pillow at the top and it makes it just perfect. I am finding the lower half is flattening out and I have only used it a few weeks. I am following up on this pillow I purchased in May of 2016. It is January 2017 and it has flattened out significantly. The 5.25" height is down to 4" and the bottom part of the pillow as stated was flattening out after only a few weeks. Pillow works but does not last. "Where can I get pillow cases for this"
We do not currently have a pillowcase specific for this shape, you can use a standard pillowcase and fold the excess inside. I actually found fitted baby bed/crib sheets work well as a pillow case.